Clear Sealers for Concrete Indoor and OutDoor Concrete Surfaces. 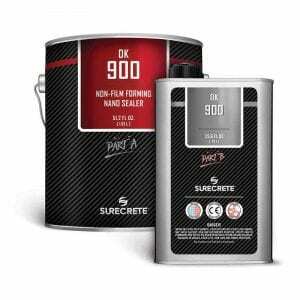 SureCrete manufactures some of the worlds latest technology in clear concrete sealers and coatings. Are you sealing clear concrete or adding some color? A few factors need to take into consideration. Is the sealer to be used indoors or is it to be outdoors. Sealers that can be used outside like the Sure Seal family of sealers can be used inside and out, they are vapor permeable acrylics. Conversely, the Dura-Kote line of sealers should not be outdoors because there are not vapor permeable. There are also much more durable than acrylics. 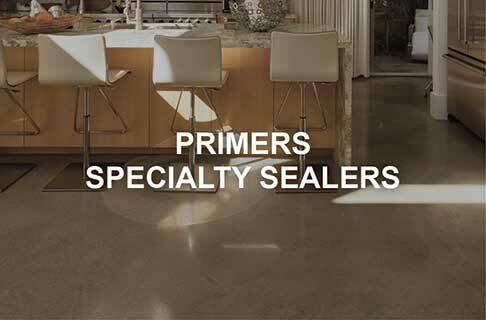 Even if you want a Gloss or satin finish will help you determine your which sealer to use that seal’s concrete. For indoor coatings, you can select from our extensive varieties of polyurethanes, polyaspartic or epoxies. If you’re looking to protect a piece of cast concrete, check out some of the sealers in the Xtreme Series lineup. 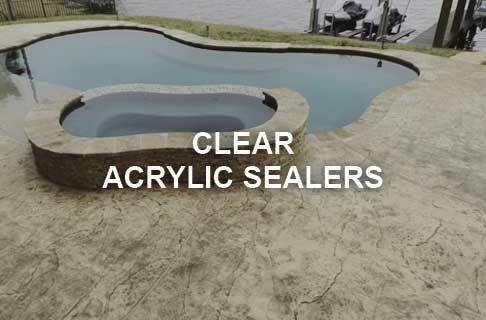 For keeping that outdoor concrete application strong, try one of our Acrylics or Cure & Seals. And, of course, no matter what your project needs, we can find you a pigmented sealer for indoor or outdoor use through our ON DEMAND coatings that will perfectly match your color schemes. So put SureCrete to the test, as we pride ourselves on providing the strongest and most comfortable to apply sealers and coatings in the concrete industry so that you will always be using the very best coatings product on the market including staining real products. We’re confident that we have a sealer that will perfectly match your project needs. 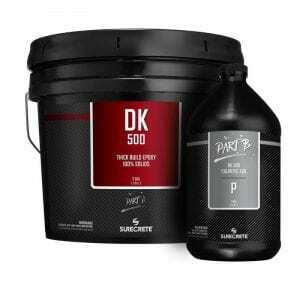 SureCrete’s DK-500 and DK-600WB are clear concrete epoxies for applying 3d metallic pearl pigments and priming concrete floors. 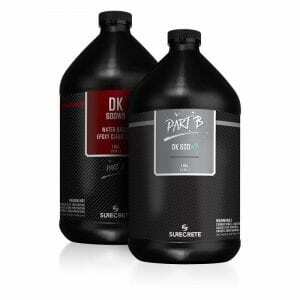 DK 600WB is a water-based Epoxy that is used for priming concrete floors. Being a 2-component coating, it can easily be applied and will help “shut off” outgassing in concrete. For commercial and garage floor concrete based, the best way to add protection is to add thickness or millage. The best way to do that is to use some form of an epoxy. At SureCrete we’ve strives to create the most efficient and easiest to apply epoxy floor coatings on the market. Any epoxy sealer will be an eco-friendly choice, with our Water Based Epoxy coming in just under 100 g/L VOCs and the Epoxy 100 product being a completely solvent-free 0 g/L VOC product and is as easy to apply as floor stains. Your choice between the two depends on mostly upon solids content. Whichever your application may be, we pride ourselves on providing the best epoxies in the industry at cost-effective pricing, able to be picked up at any of our conveniently located distribution locations around the United States. Installers that designs concrete looks love our epoxy for its ease of use. What’s the Difference Between Floor Epoxy and Similar Coatings? Floor Epoxy materials tend to harden somewhat more gradually, while polyester materials tend to harden quickly, particularly if a lot of catalysts is used. The chemical reactions in both cases are exothermic. Large quantities of the mix will generate their heat and greatly speed the reaction, so it is usual to mix small amounts which can be used quickly. While it is common to associate polyester resins and epoxy resins, their properties are sufficiently different that they are properly treated as distinct materials. Polyester resins are typically low strength unless used with a reinforcing material like glass fibre, are relatively brittle unless reinforced, and have low adhesion. Epoxies, by contrast, are inherently strong, somewhat flexible and have excellent adhesion. However, polyester resins are much cheaper to design concrete floors. Epoxy resins typically require a precise mix of two components which form a third chemical. Depending on the properties required, the ratio may be anything from 1:1 or over 10:1, but in every case, they must be mixed in exactly the right proportions, and thoroughly to avoid unmixed portions. The final product is then a precise thermo-setting plastic. Until they are mixed the two elements are relatively inert, although the ‘hardeners’ tend to be more chemically active and should be protected from the atmosphere and moisture. The rate of the reaction can be changed by using different hardeners, which may change the nature of the final product, or by controlling the temperature. Architects and builders that want to create creative designs flooring love our epoxy for both residential and commercial applications. Scratch resistant durable clear coat coating products for inside high traffic flooring. 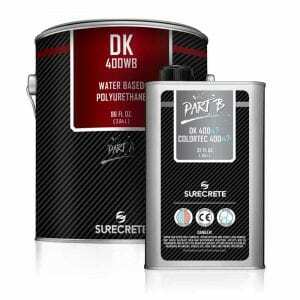 SureCrete’s DK 400 Polyurethanes are available in water and solvent based formulas. Dura-Kote DK 400 Solvent Polyurethane was our original flagship high-performance clear coat floor coating. This polyurethane can be used on stamp floor overlays, thin overlays, stained concrete, epoxy metallics, and many other floors. Dura-Kote’s DK 400WB is one of the strongest floor clear polyurethane clear coat is a very low odor, low VOC compliant, high-performance flooring clear coat. Manufactured for natural color enhancement with a gloss or satin finish option. When you’re looking to add chemical and abrasion resistance finishing coat, polyurethane coatings are your most likely product of choice. SureCrete’s Polyurethane isocyanates lineup has flexible surface applications for long protection and ridged finish when dry matte and gloss finish. Easy to apply and easy to maintain, our polyurethane formulations are some of the strongest and longest lasting interior coatings available on the concrete sealer market today for indoor and some outdoor use including the new look or protect wood looking concrete overlays. Resistant to alcohol material SureCrete’s Polyurethane can be used on furniture including finish wood concrete tables. Can be Applied with a foam roller for smooth no bubble hard finish. Our solvent-based polyurethane (available in both a satin and high gloss finish) is one of the most commonly used coatings for interior concrete floors made or remodeled by our customers. Its ease of application is second to none, and it is extremely cost effective. For those more concerned about allergens and the environment, our water-based polyurethane (available in a matte and gloss finish) is definitely the product for you. With almost no odor formed during or after application, it can be more appropriate for those dealing with allergies than even some of the best commercial-grade hypo-allergenic carpets. Combine this with its extremely low VOC content, and you’ve got a sealer that’s great for your home, your family, and the environment. At SureCrete, we think every person, contractor or homeowner, should have easy access to the highest quality concrete polyurethane sealers available. To that end, you can find our products at any of our hundreds of convenient distribution locations throughout the United States. Strong and durable clear concrete sealers for outdoor applications. SureCrete manufactures a wide verity of clear acrylic sealers to meet VOV laws as well as warm weather and freezing temperature applications. HS 200 Series is a clear stamped concrete sealer available in a low-VOC 20% solvent complaint sealer used to protect concrete with integral color and/or hardeners. 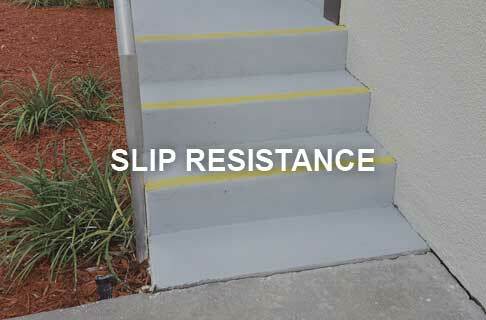 Penetration and protection for driveways, pool decks and walkways. 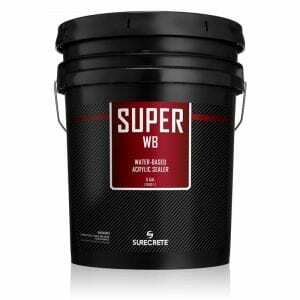 Super WB is a 30% solid, water-based acrylic clear sealer that can be applied to both vertical and horizontal concrete surfaces. 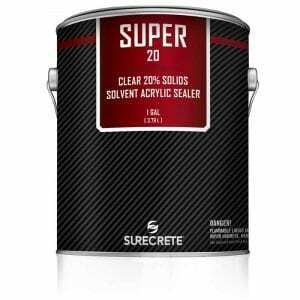 Super Series 20 / 30 is a clear solvent acrylic sealer created for use in the southeast states of the USA. Available in 20% Solids and 30% Solids. How do you select the proper clear outdoor concrete sealer? When you’re looking to protect exterior concrete, there’s just one type of sealer that you need: Acrylic. That said, there are many different types of acrylic sealers, any one of which could be the best sealant for your concrete. If you live in a climate that deals with lots of overnight freezing and daytime thawing temperature differentials, you should consider using our line of premium HS Series solvent acrylics (available in 20% and 30% solids versions). Specially formulated for superior penetration, these sealers are better suited to deal with the moisture changes inherent in a freeze/thaw environment. These are also the products we suggest if you are looking to go in a more eco-friendly direction, with lower VOC options made available. Our most cost-effective sealers are in our Super Series line, available in a 20% and 30% solvent acrylics, as well as a water-based and low-luster water-based acrylic. These products can provide superior protection without breaking the budget. Whether you need to protect a beautiful new patio overlay, or simply need to reseal an existing driveway or sidewalk, we’ve made the perfect sealant for your project readily available at any one of our many stocking locations located conveniently all over the United States. What is the difference between HS and Super acrylic sealers? or concrete overlay. Another benefit is its chemical reaction with the minerals in the cement. Silane grows crystals inside the pores slowing hydrostatic pressure, efflorescence, and acts as an additional layer of protection for staining even when the acrylic film wears off from use. It is for these features that the small cost difference between the two types of acrylic sealers is about 3-5 dollars more per gallon. From all the testing in high-temperature states such as Texas and Florida to multiple freeze-thaw cycle states like North Carolina and Pennsylvania, the HS Series constantly outperforms and outlasts all other solvent acrylic sealers on the market. What are The Different Surecrete HS Sealers? moisture migration, and delivers some added protection if the sealer wears down too far before reapplication. 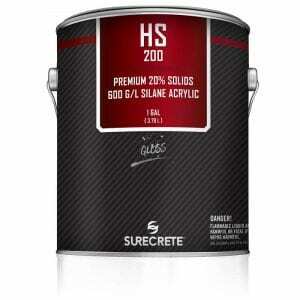 HS 200 Series – Available in 600 g/l & 400 g/l and is a 20% solids premium acrylic concrete sealer. HS 300 Series – Available in 600 g/l & 400 g/l and is a 30% solids premium acrylic concrete sealer. SureCrete’s CS Series Concrete Cure and Seal Products are Manufactured with high-quality ingredients to help cure and protect newly poured concrete surfaces for harder and longer lasting concrete life. 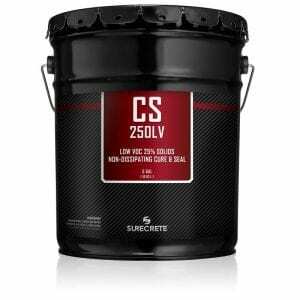 SureCrete CS Series Cure and Seal products help in the curing of concrete to make it harder for years to come as well as protecting the surface while the 28-day curing process takes place. What is the difference in a cure and seal and an exterior acrylic sealer? Answer: Acrylic sealers are the perfect exterior protection on concrete surfaces. Cure and Seals are acrylic sealers by definition but are used with a specific purpose in mind. 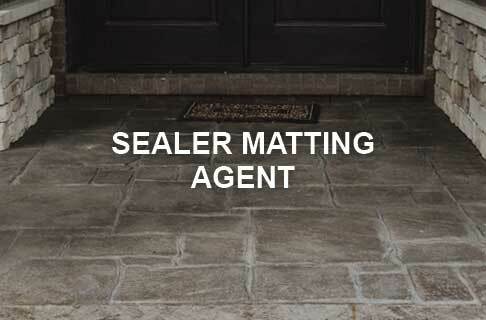 Most sealers repel moisture and stains on the surface but are breathable to allow moisture in the concrete below out. 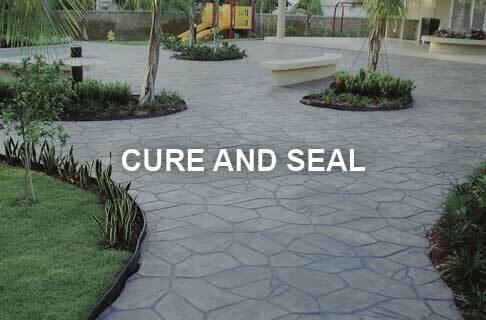 Cure and Seals though use a styrenated acrylic, with the intention of not allowing moisture in the concrete out. With this very specific attribute, cure and seals are used on freshly poured concrete surfaces that have a high amount of moisture left in the cement and aggregate surface. By doing so it slows the curing process and allows the concrete to become stronger and more durable for seal curing concrete. Dura-Kote DK Series high gloss clear polyaspartic floor coating two-part topcoat system for protecting epoxy flakes and metallic floors. The hardest clear coating available to protect interior concrete surfaces. 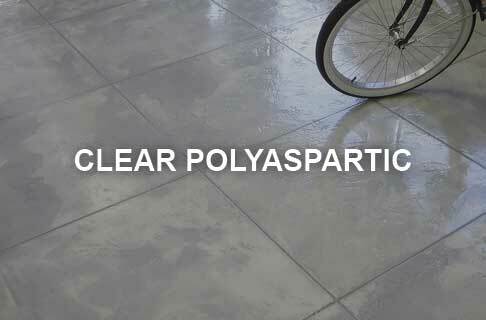 Polyaspartic sealers are color enhancing and fast curing. Great for commercial projects on deadlines. Available in 67% Solids and 80% Solids. SureCrete manufactures these products to help complete your ideal concrete surface. These products stop “bubbling” due to gasses escaping from the concrete surfaces, slow vapor transmission, and protect burnished and polished concrete floors. SureCrete’s DK700 is manufactured as a two-part floor primer to help stop moisture and vapors from releasing from the concrete prior to coating. Clear floor epoxy design to soak into the concrete to help seal off the concrete sealer from gasses and moisture coming up. DK 600WB is a water-based clear epoxy with a VOC making it able to be used in every state in the United States. DK 900 invisibly protects chemically hardened industrial floors, commercial facilities, machine shops, auto repair facilities from prolonged exposure to oil, salts and water damage. SureCrete SureFinish™ is protective floor wax for high traffic areas where a high gloss or matte finish is required. 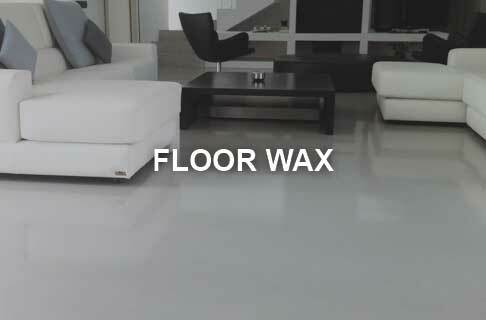 Our floor wax will help save the life of the floors “new look” while helping make your floor slip resistant. SureFinish is a specially designed floor finish that not only protects and evens the sheen of the surface but will also aid in reducing slipperiness from concrete coatings. Available in a high gloss or matte finish options. SureFinish is a product we designed primarily to help maintain the protective coating on your concrete floors but also serves as a renewal of your floor slip or skid resistance. This floor wax (available in both a gloss and matte finish) can be applied at regular intervals (depending on how much traffic your floor sees) to help keep your floors beautiful and safe. SureCrete’s SureGrip™ is a great way to make sealers less slippery and help prevent slip and falls when floors are wet or snow covered.Available in may option including, Fine grip additive, Heavy Duty grip additive, and a coarce brocast product. SureGrip can be broadcasted or added to concrete sealers and coatings to break surface tension and increase slip resistance in wet areas such as pool decks and bathrooms. No matter what type of coating or sealer you want to apply to keep your concrete flooring project beautiful and well protected, one thing every homeowner or retail store manager should be concerned with is slip resistance. Keeping your floors safe to walk and work on is just as important as keeping them looking bright and beautiful. At SureCrete, we make sure you can have all of your bases covered in preventing slip and fall accidents in your home or workplace. With SureGrip, you can mix a slip-resistant additive into your sealer or coating, so that as it is applied to your roll out your protective barrier on your concrete surface. SureGrip™ is also available in a broadcast form that can be directly “thrown out” onto your floor after the sealer has been applied, but before it has had time to dry. 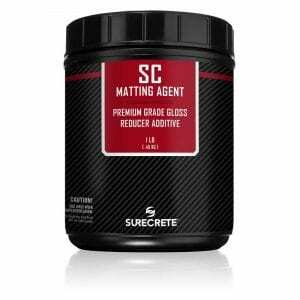 SureCrete SC Matting Agent is an additive for solvent acrylic sealers and solvent polyurethane clear top coat that lesses the gloss sheen. SureCrete’s SC Matting Agent™ provides the optimum, consistent, sealer gloss control desired by today’s discerning designers. 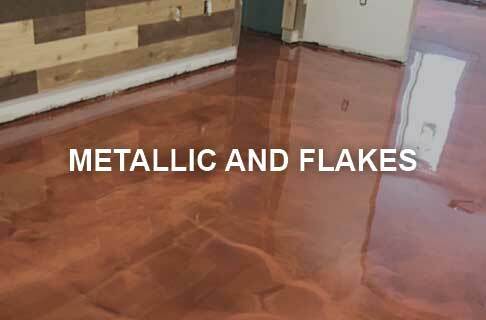 SureCrete’s full lineup of metallic and epoxy flakes colors gives customers nearly endless possibilities to create a decorative concrete floor. Dura-Kote DK Flake is a durable, multi-hued, slip resistant flooring system when combined with colored epoxy. Limitless color designs can be created. 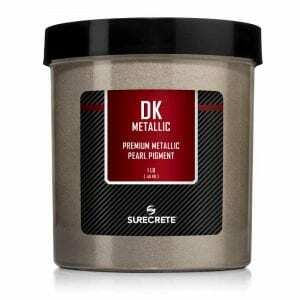 Dura-Kote DK Metallic pearls are blended into 100% solids epoxy to create a three-dimensional floor. Mix and match shimmering pigments for a one-of-a-kind look. Everyone wants to walk into a room and be “wowed”. Epoxy Flakes and Epoxy Metallics will certainly give you that feeling. While creating a look that can’t be duplicated anywhere else, these coating systems provide an immense level of stain and scratch resistance making them ideal for garage coatings or commercial heavy foot traffic areas. We’ve taken these products a step further than they have ever been in the industry by taking the colored epoxy coatings that are used in these systems and not only reformulating them to be better suited for UV stability and color fade protection, making them readily available at tinting stations throughout the country. Now epoxy flakes and metallics projects that would have normally taken days to have the product delivered can be picked up at your local distributor same day! Why stick with the same old flooring systems like hardwood or tile? Take your space into the 21st century with an ecologically friendly epoxy flake or metallic floor coating that will last and make your garage the talk of the neighborhood. ARE EPOXY FLAKE FLOORS ONLY FOR GARAGES? Although the most popular venue seen and advertised with an epoxy flake or chip floor is a garage. The applications and benefits of this system are not limited to vehicular parking spaces. All interior rooms, which are not exposed to constant hydrostatic pressure, can have this flooring installed. Features of an epoxy flake floor are more than design and curb appeal. The chip system gives a level a cleaner look, low maintenance cleanup, hypo-allergenic, increased light reflective, fantastic wearability, increase slip resistance, and reduction of tire marks. If any or multiple of these attributes are needed, then epoxy flak is the smart flooring choice. In residential housing, standard applications for epoxy flake flooring are the garage, kitchen, sunrooms, enclosed patios, bathrooms, barns, and sheds. Similar areas are used in commercial and retail locations. These will include food prep stations, kitchens, service areas, entryways, automotive centers, under roof bays, bathrooms, and enclosed wet areas. Hospitals and veterinarian clinics utilize this system for its allergy free and ease of cleaning. CAN I BROADCAST FLAKES INTO YOUR WB POLYURETHANE? You could but you will not get the desired effect of a flake floor. The flakes need to be broadcast into a sealer that is thick enough to suspend them within the sealer as it dries. WB Polyurethane is meant to go out as a thin coating and in fact, will whiten if put out too thick. So for optimal performance, it is best to broadcast into a Dura-Kote line of Epoxies and Polyaspartics. Can I install a solvent based sealer over my existing water based sealer? No, The two are not compatible in that way, you would want to install a water-based sealer over to existing water-based sealer. The solvent sealer will dissolve the solids in WB sealer and make a slimy mess. But you can install a WB sealer over a solvent base sealer as it will not dissolve the base coat. Either way, you must make sure the surface has been roughed up and sound before applying any sealer. After I rolled my sealer on it got white in certain areas, what causes this? More than likely “moisture” The sealer, especially solvent acrylic sealers if rolled on to heavy can experience this problem. It is caused by the solvent evaporating too quickly at the surface, creating a sealing film that will not allow the remainder solvents to evaporate. It can also be caused by excessive moisture in the slab that cannot escape because the coating is too heavy. Remember when sealing concrete or concrete stain “thin is to win” when applying most coatings. Better off with two thin coats than 12 thick coat. What types of concrete coatings, sealants, and sealers are available? When looking at the choices in cement-based concrete sealants you have four main sealer technologies’ to choose from: acrylic, polyurethane, epoxy, polymer. Each concrete sealer has specific attributes that make it a great choice for concrete surfaces. Each concrete sealer is available in both solvents based and water-based formulations. Water-based is not always better than solvent based, but it usually provides a lower VOC content which is important in low VOC states. As of January 2018, these states have specific VOC laws for concrete coatings, sealants, and sealers? How to Choose an Exterior / Outdoor Concrete Sealer? Due to the constant moisture which comes in contact with exterior surfaces, it is essential to choose a breathable exterior concrete sealer. Commonly acrylic sealers are used because they breathe and can let out trapped moisture coming up through the concrete. Although it releases moisture out in a gas form, it still repels moisture and oils that come from the top of the concrete surface. If you live in the south portion of the United States you deal will intense heat and UV. Attributes to look for when using a sealer are the bonding strength, hot tire pickup, and the quality of the acrylic used. Low-cost acrylic sealers have a lower quality acrylic and therefore wear down quickly causing a short time of protection and a higher maintenance for resealing. SureCrete suggests the use of the Super 20 or Super 30 acrylic sealer in states such as Texas, Florida, Alabama, Mississippi, and Louisiana. Super 20 – 600 g/l and is a 30% solids acrylic concrete sealer Super 30 – 600 g/l and is a 30% solids acrylic concrete sealer Super WB – Low VOC 100 g/l and is a 30% solids concrete acrylic sealer.